Get an instant overview of all your invoices for the year. See exactly what's cleared and what's outstanding month to month all on one screen. Find yourself sending the same invoice on a regular basis? Using Bluesky's invoice duplication feature take away all the hassle. All your invoices are clearly labeled making it super easy to see instantly what invoices are in draft state, sent, paid (or partially paid) or overdue. Bluesky integrates with online payment gateways such as Stripe which allows for your client to make payment to you direct from your invoice. Trusted by businesses all over the world. Start now with a 30 day free trial. Set up recurring invoices, online payment, and automated reminders once, and Bluesky will do the rest. We’ll send recurring invoices when you specify, take care of online bill collection, and even remind your clients about outstanding payments with a personalised, professional message. Bluesky gives you the ability to completely customise your tax and shipping rates and add different discounts to your invoices. Plus for those common costs such as Sales Tax, Bluesky can add those for you automatically. Use Bluesky online timesheet to track your hours and invoice for them automatically. 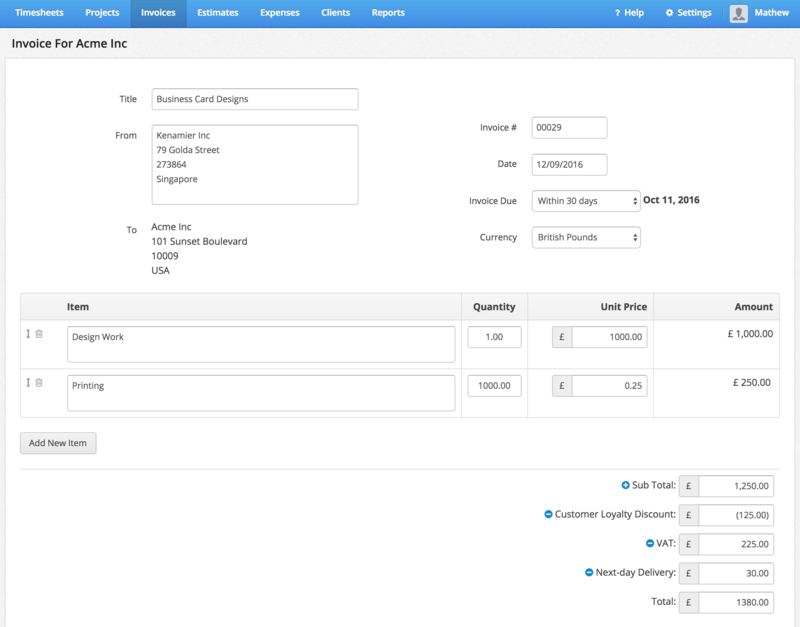 Bluesky invoices are designed to look professional right out of the box. In just a couple of clicks your latest invoice will be heading to your clients inbox. Add your logo to your invoice to give it that personal touch. Give your client the right impression with a professional looking invoice. Bluesky does not restrict you to a single currency, invoice your clients in multiple currencies with ease. Give your clients a great impression by sending them a professional looking invoice.